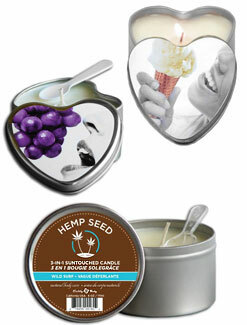 These deliciously scented candles are not only a candle but a massage oil and great moisturizer. The ingredients are 100% natural, vegan, nontoxic, and petroleum free with 8 natural oils including Hemp Seed, Vitamin E, Jojoba, Avocado, & Apricot which all leave skin soft and smooth. They come in a variety of sizes and you can choose between scented and flavored and scented types. They are wonderful for massage with a partner or as a skin moisturizer right out of the shower or bath. Simply burn the candle until it is partially liquid. Pour or spoon into your hand and apply as massage oil or moisturizing oil. * Please note that Earthly Body products can only be shipped within the USA. Please Note: Each candle comes with a spoon. The scented candles are NOT edible, only the flavored candles are able to be consumed. The Earthly Body Jute Gift Bag comes with three of Earthly Body's most popular flavored massage candles in a lovely gift bag. Comes with 2 oz. Grape, Cherry, and Strawberry Massage Candles. The Earthly Body Jute Gift Bag comes with three of Earthly Body's most tropical themed scented massage candles in a lovely gift bag. Comes with 2 oz. Skinny Dip, Dreamsicle, & Polynesia Massage Candles. Why Are These Candles Outstanding? The candle contains all natural ingredients such as soybean oil, hemp seed oil, coconut oil, almond oil, and vitamin E.
Fragrance derived from natural sources. It comes equipped with a handy spoon for dispensing. Furthermore, it was not tested on animals. This is a must have! Why Hemp Oil Is Used? Industrial hemp that's used in cosmetics is not the same as marijuana even though the seeds are derived from essentially the same plant. The seeds are sterilized-thus virtually removing any trace of THC - the 'mind altering' compound found in the drug. Hemp seed oil is known as "nature's most perfectly balanced oil." The high concentration of essential fatty acids (EFA's) have the ability to enter directly into the lipid layers of dry skin cells and replenish the oils missing due to sun exposure, poor nutrition and other abuse. Dermatologists claim that EFA's replenish dry, damaged skin, preventing cell loss and creating younger looking skin. Hemp Seed oil has been used to heal dry skin and even minor burns. Hemp helps save the planet! Industrial hemp can be grown with relatively little fertilizer and without any pesticides that have been known to pollute ground water and river systems. My friend gave me an Earthly Body Skinny Dip Suntouched Candle for my birthday. She said that I was going to love this clever candle as it was not just for my nose! The candle has a beautiful scent that caresses the room for hours. I am still blown away that you can use the melted candle wax to moisturize your body. This is a creative, fun and effective luxury that is quite affordable and makes such a great gift! Thanks for the great products you sell! When I saw these candles I was immediately drawn to them because of their scent! I love soy candles due to the fact that they are safe and do not emit poisonous fumes like many other candles. Soy candles are clean burning and these in particular not only smell wonderful, they feel wonderful on your skin! These candles melt oil meant for massaging into your skin. I absolutely love them and use the oil all over, including my lips to keep them from chapping. All the scents are great, my favorite right now is Skinny Dip because it is soft like vanilla with a hint of exotic sweet spice. They also make great gifts and are sure to be the topic of conversation when you give them. The oils feel so warm and sensual on your skin, it is a treat that you can't pass up!